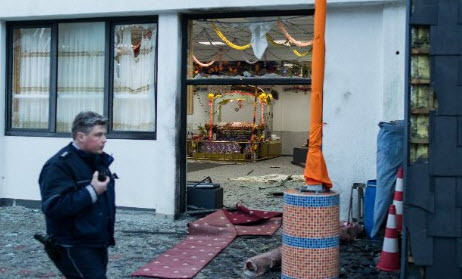 News that the Sikh Gurdwara in the western German city of Essen may have been attacked by young people linked to a local fundamentalist extremist network has shifted focus away from far right groups, who were initially suspected for the attack. Police have suggested that the two suspects arrested have links to a local Salafist group and that further arrests will be made in the coming days. The attack has shaken the small Sikh community in the city and particularly at a time when Germany is seeing a resurgency in far right activity, partly caused by the refugee crisis. However, this attack may also highlight criminal activity that on many occassions, is linked to extremist groups and also helps in providing resources for their criminal actions. The bomb exploded at a temple belonging to the Sikh Gurdwara Nanaksar congregation wounding three people – one of them, a Sikh priest, seriously. Hundreds of guests use the facility and on the day of the bombing, a Sikh wedding had taken place. This is another twist and turn in the cycle of violence that extremism and terrorism create. On this occassion, it seems that young people have resorted to what seems to be an act of terrorism against a community that has no link to any of the geo-political issues which drive Jihadist narratives. These young men also seemed to have turned against a community that is tiny and which no doubt will feel an even greater sense of insecurity because of what has happened to it. It is truly sickening since attacking a Gurdwara sends a message to all those who use the temple. It is a neon sign saying – we deny your right to worship peacefully and to exist. It really is sickening.